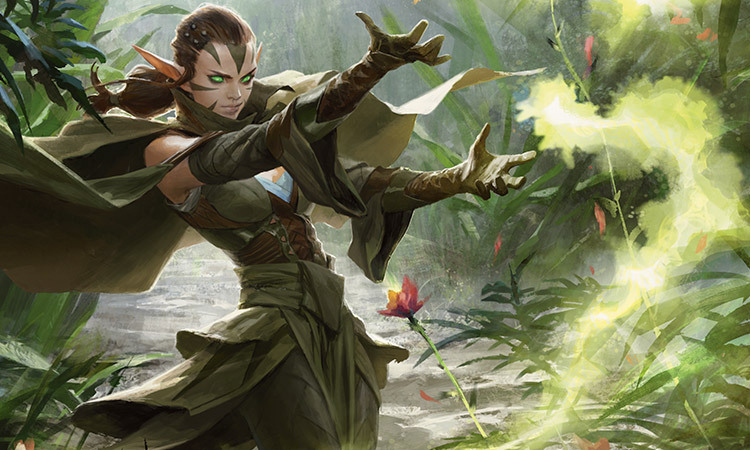 Having finally let go of the doubt and fear that was holding her back, Nissa has bonded fully with the power of the land, the soul of Zendikar. 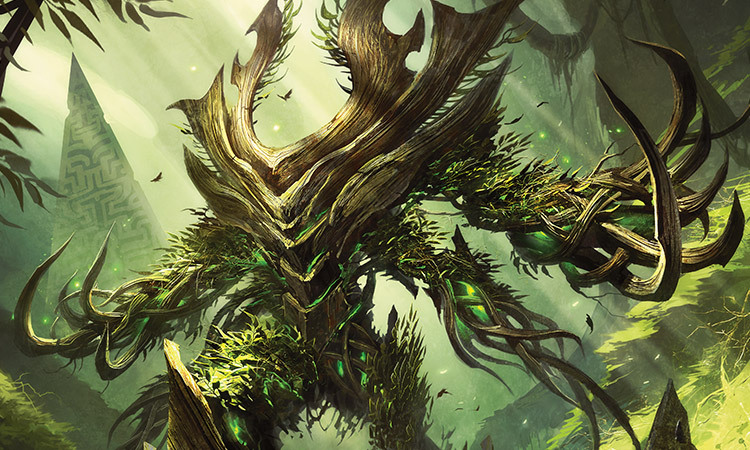 Her connection allows her to move as one with the towering tree-like elemental, Ashaya, coordinate attacks with ranks of smaller elementals, and wield aspects of the forest—trees, vines, land, and foliage—as extensions of her being in her battle against the Eldrazi. She carries with her a bundle of seeds from trees that have been wiped out by the Eldrazi, and she will not stop until she can plant them safely on Zendikar again. She fights with a singular focus: to seek out and destroy the Eldrazi titan responsible for siring the swarms, in order to save Zendikar—her home, her world, her friend. How was it that Nissa had lived on this world—this tenacious, bewitching, beautiful world—for so many years and yet missed so much? Every day there was something new, something Zendikar taught Nissa that surprised and delighted her. The land had hundreds of magnificent secrets, and it was sharing them with her. She would never have guessed that the giant mantises secreted a scent meant to simulate the odor of fresh worms and thus attract small song birds—but not for the mantises to prey on, rather for the purpose of enjoying the birds' melodies. The songs were one of the few things capable of lulling the mantises into an easy sleep. Nor would she have known that the vines draped between the close-growing, towering heart trees of the Vastwood Forest were more like arms than vines—arms that were holding hands. Each vine grew out of the trunks of two trees; it did not belong to one tree more than the other, it was shared equally between them, a tether that bound the trees. The vines connected one heart tree with its chosen companion, and allowed the two to share memories, feelings, and dreams. These trees were linked forever; they mated for life. And the gnarlids, the silly, beastly, sneaky gnarlids; they had a ritual that they managed to keep hidden from most everyone else on Zendikar. On the darkest nights, when there was no moon but the skies were clear, the gnarlids scaled the tallest trees, poking their heads above the canopies, and they laughed at the stars. Little breathy snickers that to anyone else listening sounded like nothing more than the leaves of the highest branches rustling in the wind. It was an inside joke meant only for them. Equally as impressive was the tribe of humans who lived in the lowest canopy of the Vastwood's trees—not in a central encampment, but spread out through the expanse of the forest. Five or six humans shared each treehouse hamlet, and there were over a dozen hamlets. The tribe was able to stay well informed of each other's movements and needs thanks to their ancestors, who had closely studied the language of the chatter sloths. The people sent messages to each other by speaking to the nearest chatter sloth. It was only a matter of minutes before the sloth would relate the gossip to its neighbors, who would pass it along through the network of tree dwellers. Soon all humans in the tribe would know of the hamlet's news thanks to the little gossipmongers. Today, the message was a distress call. Ashaya relayed it to Nissa as she stirred from sleep at the first light of dawn. Fartree Hamlet under siege. Two Eldrazi. Send help. Yes. Of course they would go. 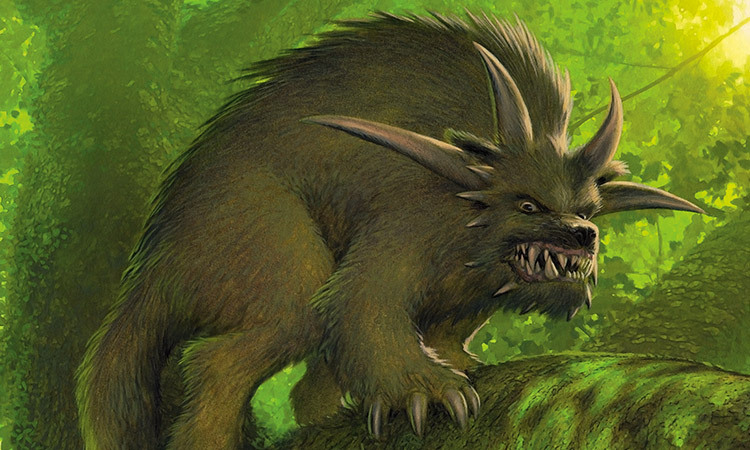 Whenever something not of this world endangered even the smallest of Zendikar's creatures, be it a beast of the forest, a fish of the sea, or a flower of the plains, the world would rise up against the threat. Nissa and Ashaya were the world; while they stood together, nothing that belonged to Zendikar would have to stand alone. They followed the sloth chatter back toward the source, running together stride for stride, the forest parting around them to make room. It wasn't long before they could feel the Eldrazi themselves, feel the destruction and pain the monstrosities were causing. But the chatter was wrong; there were three Eldrazi, not two. Nissa and Ashaya could distinctly feel three. "We have to go faster," Nissa said. Ashaya slowed for just long enough to offer Nissa one massive branch-like hand, lying it open on the forest floor before the elf. Nissa took hold of Ashaya's thumb and climbed into the elemental's palm. A chill of power, of belonging, of Zendikar, rushed through her as Ashaya lifted her up to the top saddle-like cleft of her branches. Nissa stepped into the place between the elemental's two thick wood horns. From there she could see over the tops of many of the trees as Ashaya rushed through the forest. Ashaya's long strides moved them twice as fast as Nissa could run alone. They crested a low hill before the next round of sloth chatter faded—and from there they could see the Eldrazi. There were three, just as Nissa had felt, and each was leaving a trail of corruption behind it as it moved. The trails ran like rivulets through the Vastwood. Two of the monstrosities were moving very close to each other, their destructive paths running in parallel. They were tall and shared the same body structure with bony faceplates, long, leg-like tentacles, and tentacles coming out the backs of their heads. They were on course for the treehouse hamlet and the dozen or so humans who had collected to defend it. The other Eldrazi was much smaller. It was moving alone, slithering more than walking on pink worm-like tentacles, off course from its relations. This Eldrazi was heading straight toward a thicket of ancient, towering heart trees. Ashaya came up short. Which way should they go? Nissa stiffened, her stomach clenching. There was only supposed to be one target: the hamlet. But there were two. Two families were being threatened, two communities were in desperate need of their help. Which way should they go? Ashaya did not know. Getting to both the hamlet and the thicket in time was not a guarantee. The two were too far apart, and the Eldrazi were too close to their targets. For a breath, neither Nissa nor Ashaya moved. "We have to give the most help we can give," Nissa finally said. She pointed to the hamlet and the twin Eldrazi. "We have to go that way." Ashaya agreed. Two first. Two, because two caused more destruction than one. "And then that one." Nissa pointed to the third worm-like Eldrazi. They would get to the heart trees in time. Wouldn't they? Nissa pushed her doubt aside. A call had been made. Ashaya raced down the hill toward the hamlet. In a matter of moments, they reached the collection of treehouses. The twin Eldrazi loomed above, and the humans were making their stands in the trees, brandishing their weapons—their swords and spears, bows and daggers—weapons that would never be enough for such enormous foes. But Nissa could face the Eldrazi; with Zendikar at her side, she could face them. The nearest of the two Eldrazi reached out with its bifurcated arm, swinging at the branches where the humans had collected. It was met with screams and stabs, but not enough to send it off course; it knocked one of the humans out of his perch. Ashaya reacted, reaching for the falling figure, plucking the man out of the air and setting him on solid ground. The man looked up at the towering elemental dumbfounded. "Get back!" Nissa called to him. She jumped down from her mount on Ashaya's head. "Over there." She pointed to a large rock that would provide temporary cover. "Go!" The man hesitated for another moment, but then took off at a crouched run. Nissa looked to Ashaya. "We have to get the others out of there." Ashaya plunged her massive hand into the branches of the trees, scooping two women and a man out of the canopy, and turned to set the confused and terrified humans down next to the man behind the rock. Nissa knew a faster way. She reached out with her hand and with her mind, performing the gesture Ashaya had taught her, the one that would open her to the power of the world. The next time she blinked, the world was alight. Glowing, green leylines crisscrossed the hamlet, running through the treehouses, the people, and the trees themselves. It was a network of power and Nissa was at the nexus of it. "Hold on up there!" She called to the rest of the humans in the trees. By now they had all turned to watch the giant elemental that was picking them out of the trees. Their horrified looks said that they did not know which way to point their weapons. To them it must have seemed that danger was closing in from all sides. "It's all right," Nissa called. "We're here to help. I'm going to get you down!" She thrust her arm out, aligning it with the leyline that coursed through the trunk of the thickest tree. As both Eldrazi monstrosities lashed out with all eight hands, Nissa pulled on the tree, urging it to bend to her. The tree complied. It dipped downward as though performing a bow. 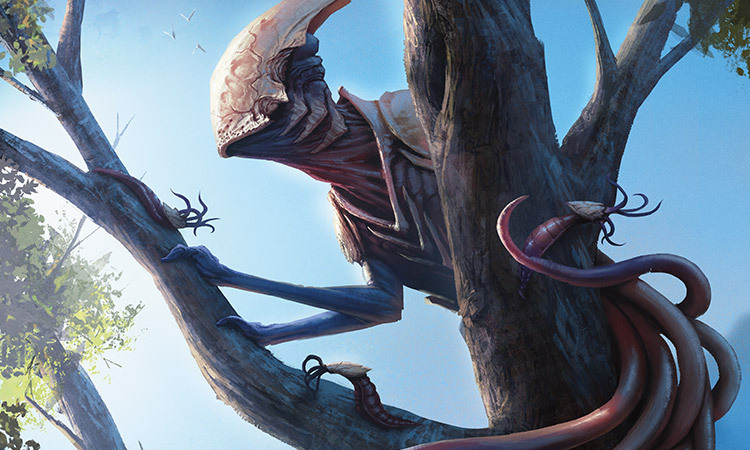 The people clung to its leaves and branches, dangling sideways from the canopy—and the Eldrazi's hungry fingers swiped through nothing more than air. "Come on! That way." Nissa waved for the people to get to the rock. "It's safe over there." With only slight hesitation, they let go of their holds on the tree and dropped to the ground, running as soon as their feet hit. The Eldrazi were gnashing now, their limbs flailing toward the bent tree. "Stay down," Nissa instructed the group. "We will stop them." "Thank you." One of the women took Nissa by the hand as the others rushed past. "By the angels of the land, thank you." "Go!" Nissa gestured for the woman to run, and when she had joined the others behind the rock, Nissa reached out through the leylines that passed through the soil around it. She pulled on the land itself, rolling it upward into a low wall, forming a protective barrier around the people, using the rock as an anchor point. They would be safe, they would not be harmed. But the heart trees . . . Nissa's mind drifted. Here. There was pain here. There was need here. With the people safe behind them, Nissa and Ashaya turned to the twins. It was time to end their reign of destruction here in the Vastwood Forest. The twin in front lurched at them, reaching through the gap left by the bent tree. "There is nothing here for you," Nissa said. "So get out." She released her hold on the tree—more she threw her weight behind it—sending it springing back up with a force so great that when it smacked into the Eldrazi, it smashed right through the monster's bony faceplate. Thick, white chunks of bone rained down. "Finish it," Nissa said to Ashaya. The elemental clambered through the trees and dug into the exposed gore of the Eldrazi's face with her branch-like fingers. The Eldrazi squirmed and thrashed, but only for another moment. Ashaya reached through its face and deep into its neck, yanking out an enormous chunk of its innards. Its limbs went limp, and then the monstrous thing teetered back and crashed to the forest floor. Cheers rang out from behind the rock. "One down. Two to go," Nissa said. Ashaya turned to the second twin just as the Eldrazi reached for the elemental's horns. It clamped its thick fingers around Ashaya's horns and pulled her down, twisting and yanking. Then it coiled two of its thick, ruby tentacles around her head, trapping her. Nissa felt the elemental's panic, her pain. Ashaya was in danger; Nissa acted on instinct. She followed the leylines that ran through the thickest, deepest roots in the ground and latched onto them. Each root became an augmentation of one of her fingers. She lifted the roots up out of the ground, and chunks of land, rock and detritus rained down. She stretched her fingers and the roots stretched; she clutched her hands and the roots reacted in kind. Now Nissa had her very own tentacles—and she whipped them at the Eldrazi. Ten lashing roots sliced into the remaining twin. "Let her go." With a flick of her wrists, Nissa retracted the roots and then thrust them again. This time she dug in, the barbed parts of the roots acting like her nails; she hooked them into the Eldrazi's muscle, securing her hold. Then she heaved, dragging first one tentacle and then a second off and away from Ashaya. Free, the elemental burst out of the Eldrazi's reach and rose up to her full height, rumbling like an earthquake. Ashaya wasted no time, she turned on the Eldrazi, pummeling it in the exposed part of its abdomen again and again. Nissa lashed her root-fingers out once more, adding her attack to Ashaya's. She coiled them around each of the Eldrazi's tentacles, holding each one separately, and then she pulled the tentacles apart, splitting the monstrosity's base, tearing its foothold out from under it. Unable to fight off Ashaya's attack and maintain its balance at the same time, the Eldrazi wavered. Nissa pulled harder, not satisfied with merely knocking it over; they didn't have time for anything but efficient destruction. She plucked the tentacles right off the Eldrazi. It hissed, and squealed, and died as it plunged toward the ground—right toward the people huddled behind the wall of rock and land. Nissa reeled around, dropping the roots at her fingertips and reaching into the land itself. She called on the leylines within the soil, moving the land, rocks, and vegetation up in a great wave that carried the people back and away as the Eldrazi struck the ground. They screamed as they were lifted up into the air, but they were safe; Nissa had saved them. "Two down, one to go." Nissa said to Ashaya. The people of the Vastwood rushed down to Nissa, effusing their gratitude. They grabbed her by the shoulders, they hugged her, and they wept into her cloak. Though she was surrounded by their warmth, the only thing Nissa could feel was the pain of the heart trees. The third Eldrazi had arrived in the thicket. "We have to go," Nissa said. "No, stay!" the woman clutching Nissa's elbow said. "You have to stay. Celebrate this victory with us." "This is not a victory," Nissa dropped her head, extricating herself from the grip of the people. "There is still another Eldrazi." "Where?" A young man looked around, brandishing his spear. Nissa pointed toward the thicket. "I have to go." "Oh, that one." A tall man waved his hand dismissively. "I saw it from above. It's on a course that won't bring it anywhere near here. We're safe." "Stay," the woman urged again. "Let us thank you. We'll make you something to eat. You must be famished." "You are safe, but the heart trees are not," Nissa said. She looked to Ashaya and nodded. The two took off for the trees without further word to the people. There was no time; they had already taken too long. Zendikar shared Nissa's anxiety. As she raced through the forest, trees parted, roots moved aside, and rocks smoothed to make way. Branches offered themselves to her, handholds to help her along. With the forest's help, Nissa moved just as fast as Ashaya. The closer they got, the stronger the sensation of loss and destruction became. Nissa came up short at the sight. The thicket was no longer a thicket; it was a corrupted wasteland. All that remained of the grove of ancient heart trees was a single pair. They stood, linked by their tether, in the middle of a chalky white clearing. All the others had been turned to dust. And now the third Eldrazi was perched up in one of the two remaining heart trees, its tentacles wrapped around the tree's trunk, about to siphon the life out of it. Both she and Ashaya lunged, but the Eldrazi was too quick. It tightened its grip, and it fed. The corruption spread fast through the tree, down its trunk, up through its branches, and out into the tether. With a rumble of rage, Ashaya batted the monster out of its perch. It tumbled to the ground. Less than a breath after it hit, Nissa called out to the land beyond the corruption on both sides of what was once the thicket, willing it to rise up like two tidal waves and crash down on top of the Eldrazi. The monster was both killed and buried in the same stroke. Ashaya looked to Nissa. Three. They had eliminated all three. "But too late." Nissa turned her gaze to the pair of heart trees. The vine that hung between them had been broken. The corrupted part had disintegrated. Now what remained of the trees' bond hung limply from the single remaining tree, blowing in the breeze—a breeze that would be unfamiliar to a tree that was used to living in a protected thicket. So much had changed for this tree in such little time. How could Nissa possibly explain it? The tree's companion was gone . . . gone forever. But the living tree could not know that, it would keep holding onto their bond, it would continue to reach out with its hand, with its heart, with its soul—and it would be met with only emptiness, always emptiness. How could Nissa make it understand? How could she tell it that its companion had not left by choice? That one heart tree would never leave another—ever? Nissa approached the last tree, walking across the rubble of the Eldrazi's grave. She placed her palm on its trunk. "I'm sorry," she said. "I'm sorry we were too late." Her throat tightened and heat burned the corners of her eyes. Ashaya joined Nissa, placing her own massive palm on the tree's trunk. Nissa could feel the message Ashaya sent to the tree on behalf of Zendikar. Zendikar promised that the heart tree's companion would never be forgotten. Zendikar would fight back. Zendikar would not stop until the Eldrazi were gone, until this kind of pain could be ended forever. Zendikar still hoped for that day. Nissa drew her hope from her friend. They would press on. They would forever press on—until they had found the titan, until they had destroyed it, until they had won. Nissa and Ashaya stalked through the Vastwood for days. As long as they continued to see Eldrazi with more regularity, as long as the forest was becoming more densely populated with spawn, Nissa believed that they were on the right course, that they were headed toward the titan. Their pursuit had taken them from the far south end of the forest, through the thickets, and now out toward the sea again. Perhaps the smell of salty sea air meant that the titan they were stalking was not on Tazeem. So be it. They would travel by boat to Guul Draz then, or Akoum, or Murasa—Nissa would even go back to the fallen land of Bala Ged, if that's what it took. But for now, right now, she would stop, for just a moment, and drink. They had come upon a thin winding stream, one that fed into a waterfall; Nissa could tell by the sound of the rushing, falling water just beyond the grove of trees. Nissa climbed down from her perch on Ashaya's head, glad to be in the shade for a moment. She knelt by the stream and cupped her hands for a drink. Between sips of fresh water, Nissa leaned back, taking in the beauty of this unspoiled grove. From where she sat, she saw no Eldrazi corruption. It was a perfect pocket of Zendikar. Ashaya joined her in the feeling of peace. This pocket of Zendikar was lucky. It had not known hurt yet. And Nissa promised that she would do all she could to ensure that it never would. Having had her fill, Nissa looked up to her friend. "Shall we walk to the sea?" —and then her breath hitched, catching in her throat—she could not get air. A sharp pain shot through her chest, freezing her in place. An Eldrazi . . . it must have been an Eldrazi . . . she had been stabbed in the chest. Where had it come from? She looked down, expecting to see a tentacle or a bony protrusion sticking into her chest—but there was nothing there. She scanned the grove—nothing. No Eldrazi. No corruption. Underfoot, Ashaya's hand began to tremble. The elemental was in pain too. Excruciating pain. A second, more brutal wave of pain shot through Nissa, this time it felt as though her insides had been ripped out of her stomach. Ashaya racked and thrashed, sending Nissa tumbling off her hand, gasping for strangled breaths. Nissa reached for her friend, but the world seemed as though it was expanding infinitely, the space between Nissa and Ashaya widening into an endless abyss. Ashaya pivoted and staggered toward Nissa, her movements stilted and unsure. Nissa could no longer feel the elemental. Could Ashaya no longer feel her either? "Ashaya!" Nissa's cry came out broken. The elemental bent her head in the direction of Nissa's voice. She had heard—or perhaps it was merely that she was falling. Ashaya came crashing down, her thick tree-trunk body aimed straight for Nissa. Nissa braced herself—there was nothing more she could do. But then at the last moment, Ashaya thrust out her arm, launching herself to the side and away from the small, breakable elf. Nissa watched as Ashaya's branches snapped and shattered on the ground. "No!" A third wave of pain tore Nissa asunder. For an endless time there was nothing. When Nissa's breath came back it was in great gasps; she couldn't get enough air. The silence around her was heavy and oppressive. And her vision was dull. Ashaya. All she could think was Ashaya. Nissa reached out into the land to summon the elemental. But there was nothing there to grasp. She reached deeper, plunging her feeling into the land. But that was where the silence was coming from. Nissa's ears rang and the world spun. She dragged herself over to the pile of branches and mounds of dirt. Her trembling fingers flitted over the broken pieces. Which splinter of wood had been Ashaya's finger? Which leaf had grown from the top of her head? Where were the roots that had held her soul? Nissa staggered to her feet, but the sensation of vertigo sent her back down. She hit the ground with a hard smack. A sharp rock cut her cheek and a mound of dirt dug into her side. The land did not cradle her, it didn't protect her—it hurt. Nissa pulled herself up, holding on to the thorny branches and the flimsy vines. Alone, she worked her way to the edge of the tree line where the stream turned into a waterfall. She looked out over the land, searching for her friend. The view before her was not what Nissa was expecting to see. They had reached the edge of Tazeem—she could see the sea not far off. But down below was another sea, one made of piles of Eldrazi so thick that Nissa could not make out the ground. Had it been those Eldrazi? Had they done something to Zendikar? Had they taken Ashaya? Nissa looked back to the fallen branches. There was nothing there. Ashaya was not behind her. She pressed forward, stumbling down the crag toward the sea of Eldrazi below. She could make out the lighthouse of Sea Gate in the distance. But she could not see Ashaya. If these Eldrazi had taken Zendikar, had taken Ashaya, Nissa would make them give it back. She fell once and again. The land did not react to her presence. The brambles did not move so she would not get scratched. The vines tripped her rather than supporting her. It felt like she was missing her own limbs. It felt like she was missing part of her soul. Nissa staggered into the mass of Eldrazi. They gnashed and scraped all around her. "Ashaya!" she called, lurching between the monstrosities. "Ashaya!" 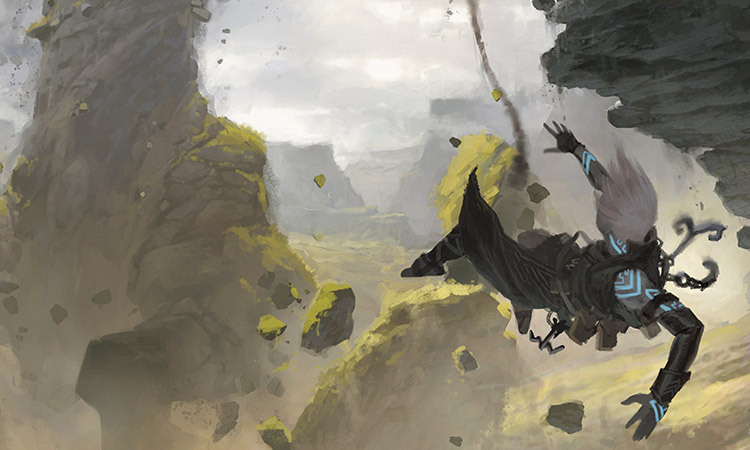 She tried reaching into the land again, but there was nowhere to ground herself; there was so much corruption, so many crisscrossing trails of it—was there anything of Zendikar left at all? The cry came from behind her, but before Nissa could turn, something large, sharp, and hard slammed into her back, sending her straight down into the corrupted ground. A cloud of white chalky dust engulfed her, and when she tried to push herself up, two arms pinned her down by the backs of her shoulders. "Stay down." Nissa twisted as much as she could to see what had pinned her. It was a merfolk, one clad in thick, sharp armor made of seashells. "What were you doing?" The merfolk's tone was accusatory. "You almost walked straight into that thing." She nodded to the right where a massive Eldrazi was grinding along. "Are you hurt?" Yes, Nissa was hurt. The pain was still there, in her gut, in her chest—all over; everywhere that Zendikar was not—and Zendikar was not anywhere anymore. "I don't see any wounds." The merfolk was assessing Nissa. "No corruption." She let up on her hold on Nissa's shoulders; the grinding Eldrazi had passed by. "Listen, I know we're in a bit of a rough place right now, but I need you to stay with me here," the merfolk said. "That's the only way we're going to get out of this alive. Are you listening?" "It's gone." Nissa blinked at the merfolk. "Did you feel it too?" "I don't know what you're talking about," the merfolk said, struggling to her feet. For the first time Nissa noticed that the merfolk was injured, quite badly. One of her legs was wrapped in a tight tourniquet that was soaked through with blood. "But I do know it's time to move." She yanked on Nissa's arm. "Come on!" The tugging. The blood. The tension in the merfolk's voice. The Eldrazi closing in. The realities of the world around Nissa suddenly started to sink in. She shuddered. It was as though she had wandered blindly into this nightmare. Ashaya was not here, that much was clear. And now Nissa was in extreme danger. So was the merfolk. There were too many Eldrazi. "Come on." The merfolk tugged again. "It's coming!" 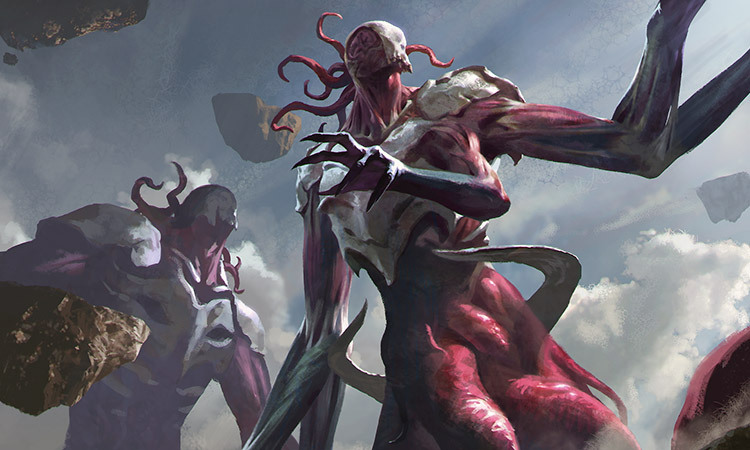 One of the Eldrazi—a thick one with too many limbs—was pulling itself straight toward them. Nissa had to do something. She pushed herself to her feet. "That way is out." She pointed back the way she had come, toward the crag. The merfolk nodded, and half hopped, half dragged herself along. She would never make it, she wasn't fast enough. Nissa had to do more. "I've got you." Nissa lifted the merfolk and shouldered her. Just in time. The nearest Eldrazi sent a flailing tentacle toward them. How was it that she hadn't seen any of this on her way in? The bodies, the destruction. The corruption. This was Sea Gate—she remembered having seen the lighthouse—Sea Gate was Zendikar's seminal civilization. It was a center of trade, a bastion of knowledge; there was power here, magic. Thousands of people lived and worked here, and thousands more had fled to the safety of its walls. How was it possible that Sea Gate was now . . . this? How was it possible that Sea Gate had fallen? Was that why Ashaya was gone? A crashing tentacle cut through Nissa's despair. A long purple Eldrazi hauled itself into her path. She came up short, shifting the merfolk's weight on her shoulder, turning in a circle, searching for an out, an opening. All she saw were tentacles and appendages all around. The merfolk tensed and twisted. "There's too many!" Nissa clamped her arm tighter around the merfolk's shell armor, holding her still. "I know." She took a breath and drew her sword. It wasn't something she had done in a very long time. The blade felt unbalanced, the hilt felt hard and unnatural. It was nothing like the living leylines she was used to wielding, nothing like an army of elementals, or the land itself, but it would have to do. She had no other choice. Putting all of her strength behind the blade, Nissa sliced at the fleshy part of the long purple Eldrazi. The impact reverberated through her palms, sending shockwaves of pain up her arms and into her chest. She had forgotten how physical it was to battle this way. But she didn't stop. She yanked the blade out of the shallow gash it had made in the Eldrazi's side and hacked again. This time, the Eldrazi hit back, swiping down at her with one of its front legs, and sending Nissa flailing off balance. With the unfamiliar weight of her sword and the merfolk on her back, she couldn't keep her footing. They fell to the ground in a heap, and Nissa's sword spun out away from her, sliding across the corruption. The Eldrazi's arm came for them again—but just before it hit, the merfolk tore off the spiked shell covering her shoulder and held it up like a shield. The Eldrazi's hand hit hard, but didn't come through. It recoiled; it would swing again soon. "Do you think you can hold it off while I get my sword?" Nissa asked the merfolk. "I'll be right back." Nissa scrambled across the ground toward her blade, staying low, hoping she was out of the Eldrazi's sensory range. Three times she tried to reach out through the land for the sword, to bend the ground so it would slide it back toward her, to ask for Zendikar's help. But there was no answer. Nissa felt so alone. In the middle of this swarm of Eldrazi, she felt as though there was nothing left. One of the Eldrazi's thick back tentacles crashed down as Nissa dove for her weapon. Her hand closed around the hilt, but the tentacle landed on her arm. It was like the monster had known, like it had aimed for her arm to stop her. But it couldn't have known. They didn't know—not like that. She pulled on her arm with her all, but the tentacle was too heavy. She was trapped. Panic welled up inside her. What would come next? Would it feed on her? Her arm might have been succumbing to the Eldrazi's corruption that very moment—how would she know if this was the end? The next moment the tentacle was pulled off of her—and then ripped from the Eldrazi's body. As the Eldrazi squealed, Nissa rolled away from it. Her first thought was her arm. Not daring to breathe, she looked at it. There was no sign of corruption. She would live. But her shoulder was injured badly enough that she had to pick up her sword with her left hand. "Up here!" Another rope with a hook came down, and Nissa followed it up to a sea of faces staring down from atop a high, floating rock. The pale white face of a kor was in the front. Nissa had never been so grateful to see a kor in her life. "Take the rope. Tie the merfolk to it," the kor instructed. Nissa reeled, having forgotten the merfolk in the commotion. She let out a breath of relief seeing the merfolk still there on the ground, crawling along. "This will work," the merfolk said, panting. "Tie me to it." Nissa dropped to her knees and worked to secure the merfolk in the crook of the hook. Then she looped the rope to her own belt so she could pull the merfolk up with her as she climbed. She tugged the rope to indicate they were ready, and turned to merfolk. "My arm's out. Take the sword." "Gladly." The merfolk looked thrilled to have the weapon. She gripped Nissa's sword in one hand and the neck of the hook in the other. Nissa began to climb, hauling the merfolk up with her, favoring her left arm. As she did, the kor and his companions pulled the rope up, hand over hand. This doubled, if not tripled the speed of Nissa's ascent. She hoped that would be enough. Tentacles and other appendages flailed around her, and she could hear the merfolk hacking into the Eldrazi below her, but Nissa ignored all of it. She focused only on the rope, only on her climb. At some point, when her arms were tired and her palms sweaty, the wind stirred through Nissa's hair, cool and crisp and fresh. They had cleared the top of the swarm. The day wasn't as dark as it had seemed from the ground. The next breath Nissa took was the first in a long time that wasn't laced with Eldrazi, rot, and blood . She breathed deeply and she allowed herself to pause for just a moment. "Almost here," the kor called down as he pulled up another section of rope. "We've got you." Nissa smiled up at him. Then she glanced down at the merfolk. "We're going to make it." The merfolk returned the smile, loosening her grip on Nissa's sword, relaxing; there were no Eldrazi to fight up here. "We're going to make it." 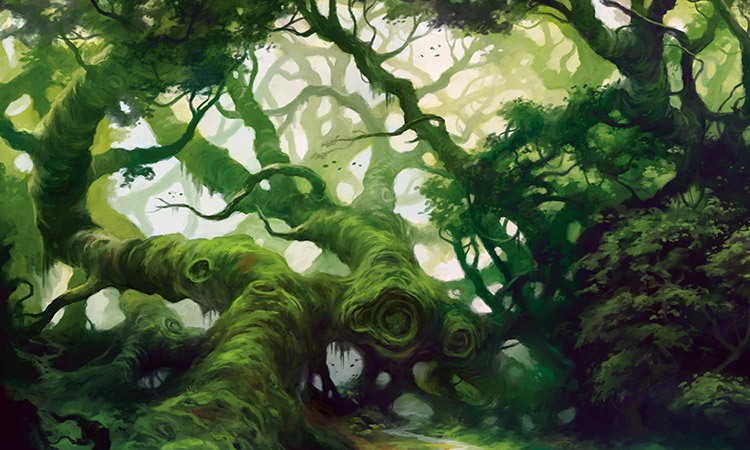 Below was the jungle of Eldrazi they were leaving behind, with its boney carapace canopy, tentacle vines, and bifurcating branches. Nissa couldn't see a single patch of ground, not even the place they had just been standing. They owed their lives to the Zendikari on the rock above. The rope lurched and Nissa followed the merfolk's horrified expression upward. 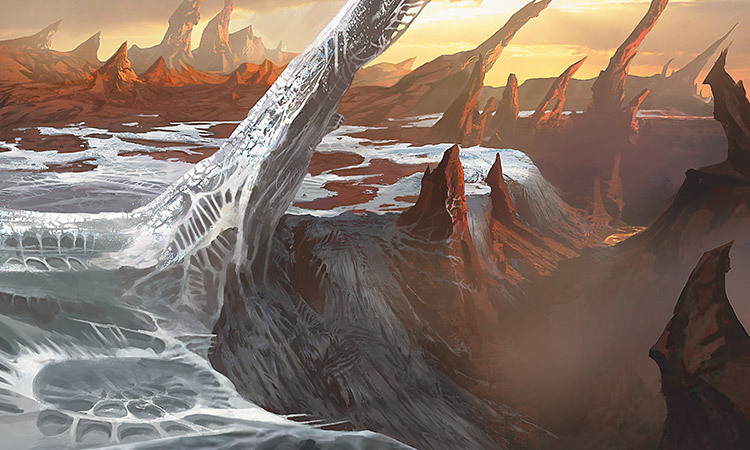 An Eldrazi the size of a large leviathan had launched itself from the edge of a second floating rock. It crashed onto the rock where the kor and his companions stood. 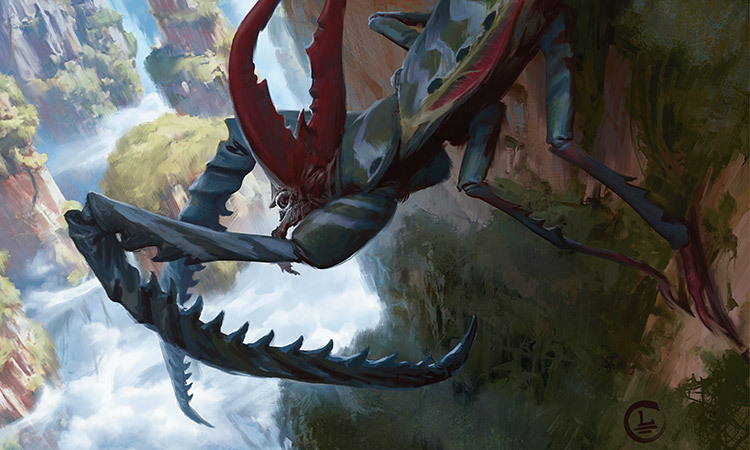 Three of the Zendikari were crushed under the giant, writhing monstrosity—and one tumbled over the lip of the rock, plummeting past Nissa and the merfolk. There was nothing they could do to stop his fall. The remaining Zendikari drew their weapons and slashed at the thick, blue appendages. Nissa clung to the rope as it swung violently under the quaking rock. "It's too big!" the merfolk shouted from below. She was right. "Give me the sword." Nissa reached down. The merfolk handed Nissa her sword. Nissa sheathed it, unbound herself from the hook, and climbed, ignoring the pain in her shoulder. "Be careful!" the merfolk called. The time for caution was long gone. Nissa kept her eyes trained upward as she ascended. The only cues about what was happening on the rock above were the sounds: the gnashing, the grinding, the slashing. Was it the kor and his party who were cutting into the Eldrazi, or was it the other way around? When she got to the top, she saw a mess of tentacles and appendages. She pulled herself up over the sharp, jagged lip of the floating rock, drew her sword, and began hacking into the thick blue flesh in front of her again and again. Eldrazi gore splattered her face, blurring her vision. Her next swing was a whiff, slicing through nothing but air. Nissa reset and swung again—where she thought she could make out a tentacle through the thick sludge that ran through her eyes. That one was a whiff too. She wiped her face with her sleeve just in time to see four glowing, white whips fly through the air and lash into the Eldrazi's side. 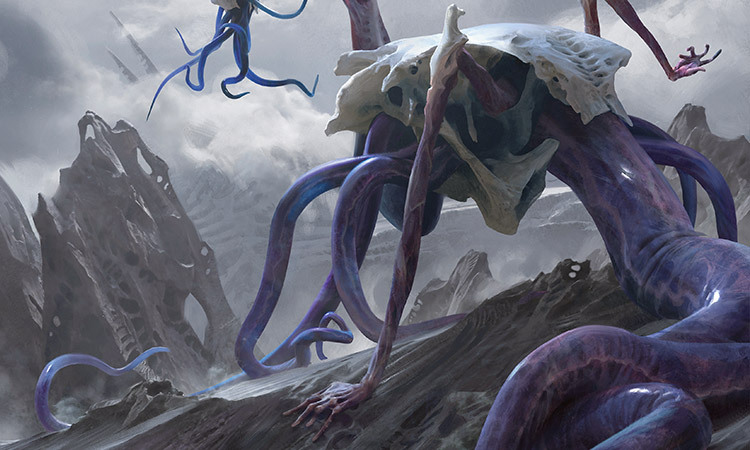 The whips wrapped around four of the Eldrazi's thick appendages. With an unnatural squeal, the monstrosity convulsed—and then it was yanked backward and flung off the rock. Two of the three Zendikari who had been trapped beneath it staggered to their feet, gasping for breath. The third, an elf, lay motionless, his skin a blistering latticework of white chalk. "Help me pull them up!" Nissa spun at the sound of the voice, brandishing her sword. There was a man crouching at the edge of the rock, a massive man, a human with skin the color of jurworrel bark and shining armor that bore patterns and shapes that Nissa had never seen before. She knew instantly that he was not from Zendikar. A Planeswalker. 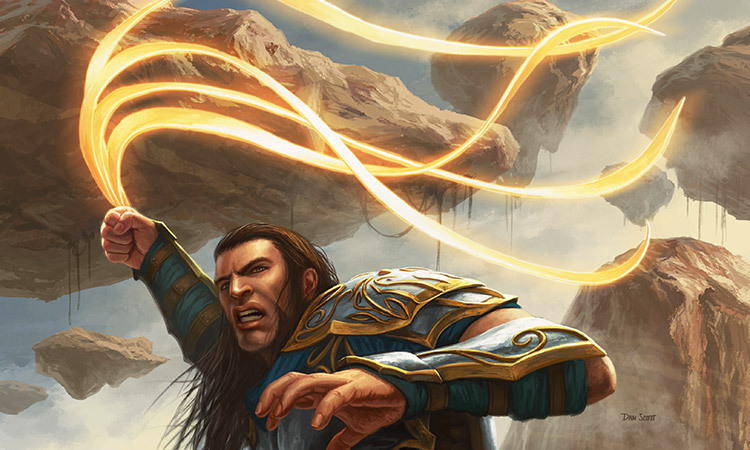 One rope in each hand, the Planeswalker was heaving both the merfolk and the four other Zendikari up onto the rock. Though he had called for it, it didn't look like he needed help from Nissa or the others who stood gaping next to her. Nissa ran over anyway. She grabbed hold of the rope that held the kor's companions and yanked. Why was he here? She would have thought all the other Planeswalkers would have left long ago, especially the ones who were not from Zendikar. "Jori En!" The Planeswalker cried out at the sight of the merfolk who pulled herself up over the lip. "Jori En, it's you! You're alive!" "Gideon." The merfolk looked just as shocked as the Planeswalker. "I thought you were gone. When you went over the ledge with the Eldrazi—"
"It wasn't as bad as it looked." The Planeswalker, Gideon, smiled. His smile was crooked, Nissa noticed. "I thought you were gone." "Managed to hang in," Jori said. "And good for that," Gideon said. "I brought him back. The man who can help, Jace is his name. He has a knack for puzzles—and he already knows a thing or two about hedrons, as it turns out." "Where is he?" Jori glanced around. "Back at the encampment." The Planeswalker nodded over his shoulder. Then he looked around at the rest of the Zendikari atop the rock, his gaze passing just as swiftly over Nissa as it did the rest. "Don't worry, I'm here to get you out of this. Is this all of you?" The kor nodded solemnly. "We were the last group. We thought the rest of you gave up on us." "Never." Gideon smiled again. "There's an encampment to the south—or at least it will be an encampment soon. For now, it's safe and it's not far. Fall in and follow me." It was astonishing how quickly he had shifted from sharing pleasantries to giving orders. But no one seemed to question his authority—or his unfamiliar accent or armor. If this man knew a way to safety, the Zendikari would follow him. He hefted Jori onto his broad shoulders; the rest in the group were well enough off to make their way on their own. With a flick of his four-bladed weapon, he tugged a thick vine down from the nearby floating rock that the Eldrazi had launched itself from. He pulled it taut and tied it off on a rocky protrusion near his feet. "We cross two at a time. We stay together. When you get to the next rock, wait for me." The Zendikari steeled themselves, nodding, and the first pair stepped up to cross. Gideon was a good leader. He was steady and sure, and he was strong. He directed them confidently from rock to rock. Nissa could see the place, not too far in the distance, where the plague of Eldrazi hadn't yet spread. It looked as though they could get there without having to descend back into the fray, and this Planeswalker seemed to know the way. For that Nissa was grateful. She kept her eyes trained on the clear land ahead, and she followed him until they made it to the outskirts. There, he directed the group back down to the ground, and their task changed from navigating vines and floating rocks to trudging through the fallen—the gore of monster and man jumbled together in the destruction. As they made their way through the trenches, they only had to face three Eldrazi. Nissa watched Gideon the Planeswalker during battle; his whip-like weapon glowed when he lashed the monstrosities, and light beaded on his skin when a tentacle or appendage came too close. This man was powerful. Nissa waited until they were in the clear, until she could see the tension fall out of his shoulders. Then she walked up to the front of the group and matched Gideon stride for stride. She had things she needed to ask him. If there was anyone else who might have felt what happened to Zendikar, it would be another Planeswalker in tune with the plane's power. And she had to know. Gideon carried his glowing weapon in one hand and Jori in the other—the merfolk had lost consciousness not long before, but the kor in their group was a healer and had done his work on her, assuring the others that she would be fine as long as they could get her to the encampment soon. Sensing her at his side, Gideon glanced at Nissa. "Gideon. Nice to meet you." He smiled that crooked smile again. It puzzled Nissa how he could manage to smile so often in the face of this kind of devastation. "That was some strong fighting back there," he said. "You took out a big one." He was referring to one of the Eldrazi Nissa had helped him fell along the way. "That wasn't how I'm used to fighting," Nissa said. "Or at least not how I'm used to fighting lately. I suppose before everything happened that was how I did things, with the sword and arrows, but now I'm used to—well a lot more. All three at a time shouldn't have been a problem for me. Wouldn't have been a problem. Even if I was alone. I have greater powers than what you saw." Gideon laughed. "I'm glad to hear the enthusiasm. And don't worry, there'll be plenty of time to prove yourself in the battles that lie ahead." "That's not—no. I'm not worried about that, about proving myself." Nissa was affronted. "I—I'm a Planeswalker. Like you." "Oh?" Gideon cocked his head, looking at her in earnest. "That's why I'm here talking to you in the first place. I wanted to know, since you're a powerful mage, if you felt something strange. Earlier today. When the sun was high. It happened suddenly. It was just . . . torn away." Gideon furrowed his brow. "What was torn away? What happened?" "When you reach out for your power—I saw you do it with the glowing whorls—it's still there? You don't feel anything different? Nothing changed?" "Yes. No." Gideon shook his head. "It's still there. Nothing changed. Why? Did yours . . . ?" Nissa met and held his gaze. "Mine is gone. It was ripped away. I've never felt so much pain. I've never felt so alone. Zendikar is just . . . gone." As she said it, Nissa felt the loss all over again. Ashaya. Her chest constricted around the empty space inside her. "I'm sorry," Gideon said. "But I—"
He was cut off by a voice crying out from up ahead and above. "They're back!" A ladder dropped down from a massive floating hedron not far in front of them. "He brought them back!" Three figures raced down the ladder and ran toward them, a kor woman leading the way. Nissa took a step back. "Dest, is that you?" The kor woman dashed into the arms of the kor healer. "I thought—" Her voice broke as his embrace overwhelmed her. "It was him," the kor, Dest, said, indicating Gideon. "He saved us." "Thank you! Oh, thank you!" The kor woman took Gideon's hand. Gideon's eyes brimmed, and he clasped the woman's small hand in his large one. "Glad to help." Cheers rose up from the encampment above, and more Zendikari descended the ladder and streamed toward them, crying out in welcome. Nissa removed herself from the pocket and watched from a distance as the others first huddled together laughing and crying, and then climbed back up the ladder up to what they promised was an encampment above. She did not want to be absorbed in their warmth right now. That wasn't where she belonged. She belonged with Zendikar. And that was all she wanted—to reconnect with her world, her friend. She knelt in the massive hedron's shadow and placed her palm on the cool ground. "It's me," she whispered. She collected herself, all of herself, every bit of her being and her soul. And though she was perhaps more afraid than she had ever been—afraid of what she would find . . . or what she wouldn't—she sent all that she was out into the land, reaching as deep as she could, probing, searching . . . hoping. "Where are you?" Her friend was not there. As the sun set on the hollow world, Nissa stood and walked toward the ladder, her hand clutched tightly around the hard hilt of her sword.